Convertible / Cabriolet cars are so much fun on a sunny day and always look prestigious when the roof is up too. Being exposed to the elements and with repeated use though, they can be prone to fading and dirt build up. Added to this, convertible/cabriolet hoods can sometimes be a target for mindless vandals. Whatever the issue you have with your convertible/cabriolet hood, we can usually provide the solution to fix your problem. From full replacement hoods to re-dyeing & re-proofing, Cheshire Car Trim are the people to call. 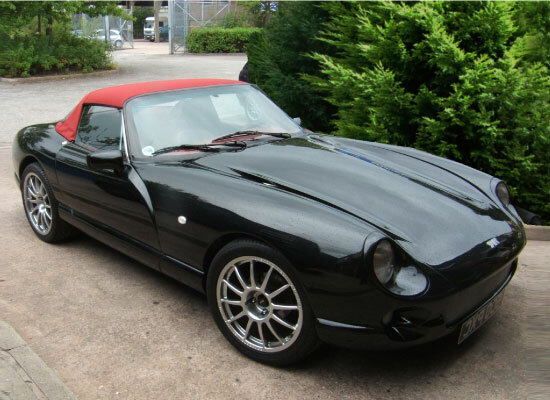 The example shown was a full replacement hood for a TVR convertible. Please note, we only specialise in manual & motorised soft top/material/mohair type convertibles, not hard top convertibles. If your soft top convertible / cabriolet is looking tired/faded or has moss/mildew build up, we can bring it back to life! With our specialist cleaning process as well as re-dyeing and re-proofing the fabric, we can make it look as good as new again! It is recommended to have your roof professionally cleaned once a year to maintain the fabric life of your convertible soft top roof. If you’re looking for a new convertible/ cabriolet hood or would simply like us to re-furbish your current one, then contact Cheshire Car Trim now!